long, ropelike stalks that hang down from the limbs of this tropical tree. The bignonia family (Bignoniaceae) is a fascinating tropical family containing many vines, trees and shrubs with beautiful, showy blossoms. Some of the well-known members of this family include cape honeysuckle (Tecomeria capensis), yellow bells (Tecoma stans), jacaranda (Jacaranda mimosifolia), common catalpa (Catalpa bignonioides), desert willow (Chilopsis linearis), African tulip tree (Spathodea campanulata), and the golden and pink trumpet trees (Tabebuia chrysotricha and T. impetiginosa). Also in the family is the unusual calabash tree (Crescentia cujete) with remarkable cauliflorous fruits that develop directly from the main trunks and limbs. 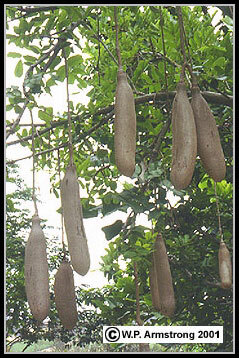 But the most unusual tree in this family is the South African sausage tree (Kigelia pinnata), with huge sausagelike fruits that hang down from the limbs on long, ropelike stalks. The positioning of the noctural blossoms below the dense branches and foliage makes them ideally suited for visits by night-flying bats and insects. 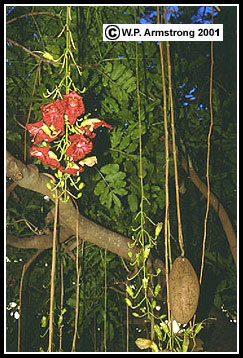 The blood-red flowers of the South African sausage tree (Kigelia pinnata) bloom at night on long, ropelike stalks that hang down from the limbs of this tropical tree. 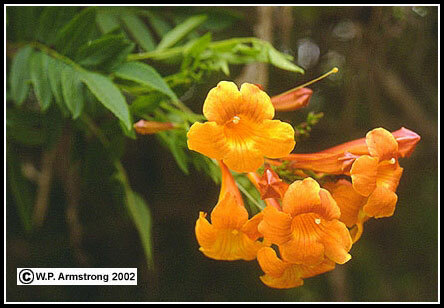 The fragrant, nectar-rich blossoms are pollinated by bats, insects and sunbirds in their native habitat. The mature fruits dangle from the long stalks like giant sausages. They may be up to two feet (0.6 m) long and weigh up to 15 pounds (6.8 kg). 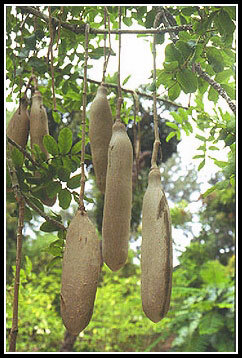 The nocturnal blossoms and elongate fruits of the South African sausage tree (Kigelia pinnata) are produced on long ropelike stalks. The hard, seed-bearing fruits may be up to two feet (0.6 m) long and weigh up to 15 pounds (6.8 kg) each. 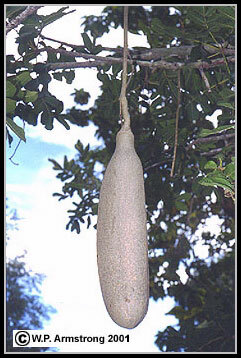 Fruits of the South African sausage tree (Kigelia pinnata) dangle from long stalks like giant sausages. They may be up to two feet (0.6 m) long and weigh up to 15 pounds (6.8 kg) each. South American Tabebuias Called "Axebreakers." Any discussion of the bignonia family (Bignoniaceae) would be incomplete without mentioning the remarkable calabash tree. There are two species that grow wild in Mexico, Central and South America, Crescentia alata and C. cujete. Crescentia alata is often placed in the genus Parmentiera and is listed as P. alata. Crescentia cujete is easy to identify because it has simple leaves and its gourd-like fruits are much larger (up to ten inches in diameter). 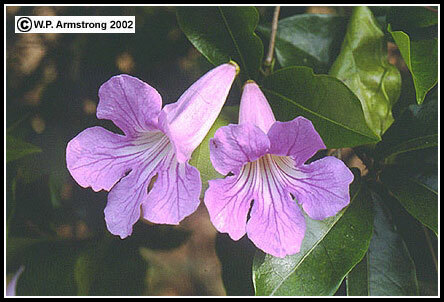 Both species belong to the bignonia family (Bignoniaceae), along with Catalpa and Jacaranda, and their flowers develop from buds that literally grow out of the main trunk and limbs. Like many other large-flowered cauliflorous species, calabash trees are commonly pollinated by small bats of the genera Glossophaga and Artibeus. According to Daniel Janzen (Costa Rican Natural History, 1983), the pollen is in the dorsal (upper) side of the flower and is placed on the head and shoulders of the bat. 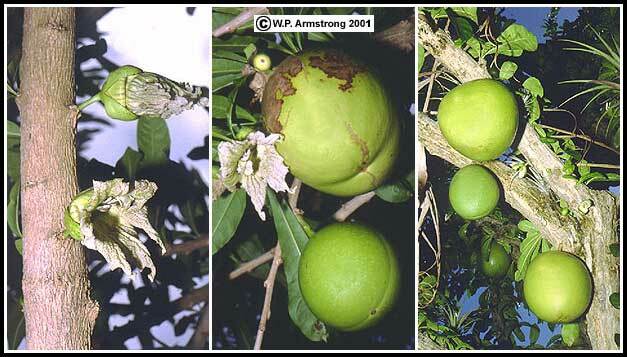 After pollination the spectacular calabash fruits begin to develop along the trunk and limbs. A crop of 100 or more of these large, green, gourd-like spheres may adorn the tree for up to seven months, before turning yellow-green and eventually falling to the ground. On the lovely Caribbean island of Dominica, Carib Indians carve elaborate designs into the woody gourds during this "softer" green stage. Because the gourds are so large and hard-shelled, no native New Word herbivores can crack them open, and the rotting gourds litter the ground beneath old calabash trees. It is well documented that horses can break open the hard shell with their mouth and eat the sweet pulpy mass inside, dispersing the seeds in their dung. In Africa, large woody pods of other species are quickly devoured by large herbivores. According to D.H. Janzen and P.S. Martin (Science Vol. 215, 1982), large grazing mammals, including extinct pleistocene elephants called gomphotheres, may have once eaten the huge gourds and dispersed the seeds in lowland forests. 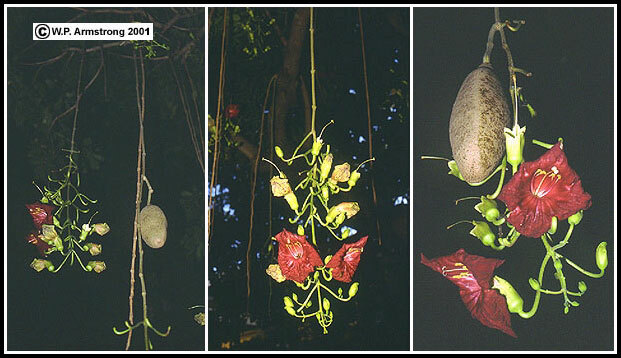 The bat-pollinated flowers and large, gourd-like fruits of the calabash tree (Crescentia cujete) literally grow out of the trunk of this striking tropical American tree. 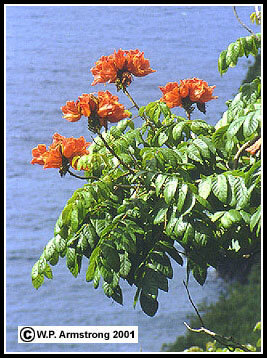 African tulip tree (Spathodea campanulata), a beautiful tropical African tree that is cultivated throughout the world. It is naturalized throughout the Hawaiian islands, such as the above photos taken on the east coast of Maui. 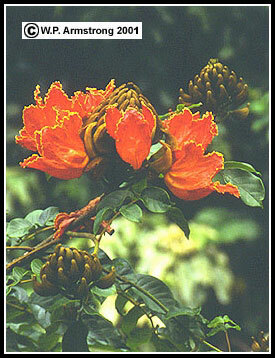 Cape honeysuckle (Tecomeria capensis), a climbing shrub native to South Africa. This beautiful shrub is commonly planted in southern California. The orange-red flowers bloom throughout the fall and winter months and provide nectar for foraging honey bees and hummingbirds. 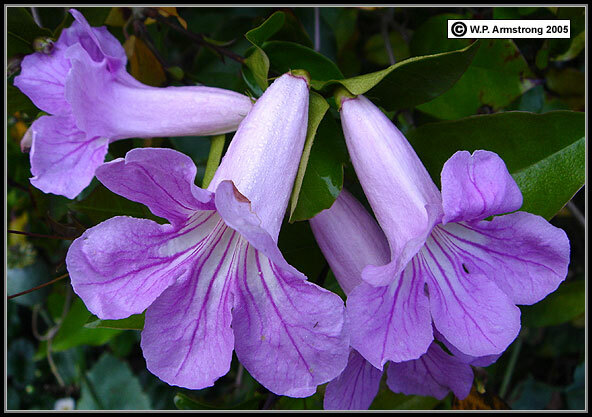 Violet trumpet vine (Clytostoma callistegioides), a climbing vine of the Bignoniaceae native to southern Brazil and Argentina. The prickly seed capsule releases numerous winged seeds that are dispersed by the wind. Violet trumpet vine (Clytostoma callistegioides) native to southern Brazil and Argentina. 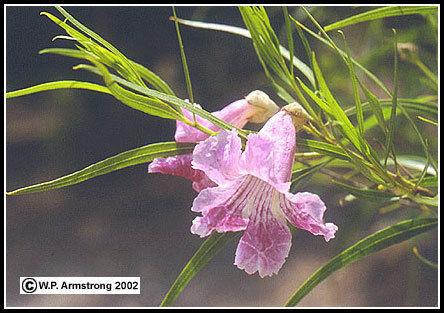 Desert willow (Chilopsis linearis), the only native member of the Bignoniaceae in California. This large shrub with narrow, willow-like leaves grows along sandy washes and riverbeds of the Colorado Desert.